last update: June 19th, 2012. This document provides additional information to those found on the Castalia web site or in the Castalia user's manual that may be useful for those who wants to quickly understand how Castalia is architectured and how new behaviors could be introduced. The official web site of Castalia is http://castalia.npc.nicta.com.au/. Here is a list of chronological material/things you should read/do in order to get used to Castalia and begin working with it. Castalia uses the OMNET++ features to define the architecture of a sensor node. All definitions are described and implemented in the Castalia-3.2/src directory. Here is a snapshoot of the Castalia forder hierarchy. In this way, all nodes will have the behavior of the valuePropagation implementation, which is defined in the src/node/application/valuePropagation folder where you will find .cc and .h files. which makes the link between the behavior that is implemented and the name of the module you have to put in the SN.node[*].ApplicationName field. // with other nodes. Connects to psysical processes so it can sample them. 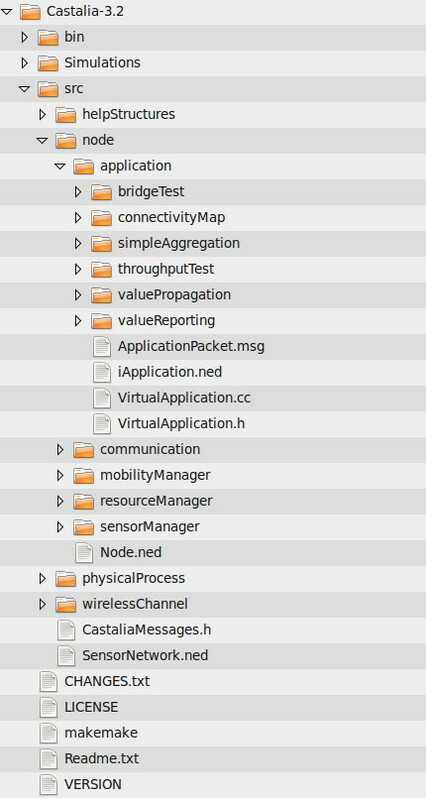 You can know the list of the various alternative behaviors by looking into the Simulations/Parameters folder. Castalia has been developped for being easily extended. In this section we will focus specifically on how to add new network behavior (routing, MAC, ...). These new protocols will most likely be part of the Node module so src/node is certainly the dedicated folder for adding your new code. First of all, you have to include your code in the development tree so that compiling Castalia will include your own code. It is very similar in adding a new application module. Where we can see that node runs CLMAC and not the TunableMAC. Currently the behavior of CLMAC is exactly the TunableMAC behavior as no changes as been really performed. But in this way, you can test your own MAC layer by incrementally add changes. Not all fonctionnalities are implemented and you must be very carefull in knowing exactely what is modeled when performing comparison studies. 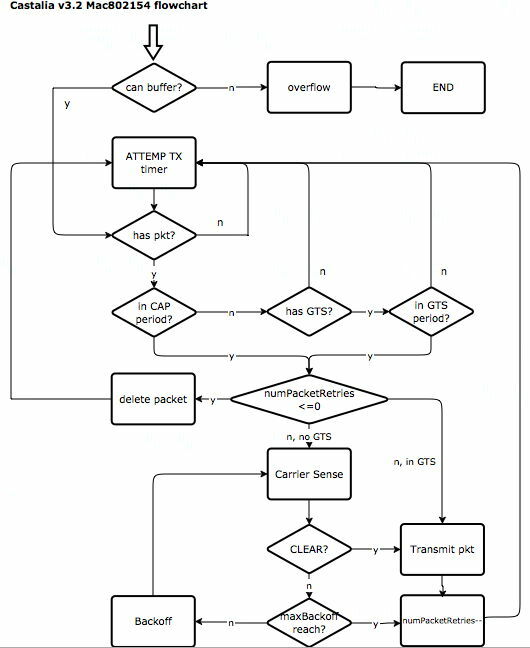 Here is a tentative flowchart description of the classical CSMA, the 802.15.4 and the TMAC/SMAC models as implemented in Castalia v3.2. These flowcharts are provided to help you understanding how these MAC modules are implemented under Castalia, not how the corresponding IEEE standards work. Although, the overall blocks can be quite similar, it is better to know the corresponding MAC standards in order to fully get the significance of these flowcharts. In addition, these flowcharts are my personal view of how the MAC layers are implemented in Castalia. 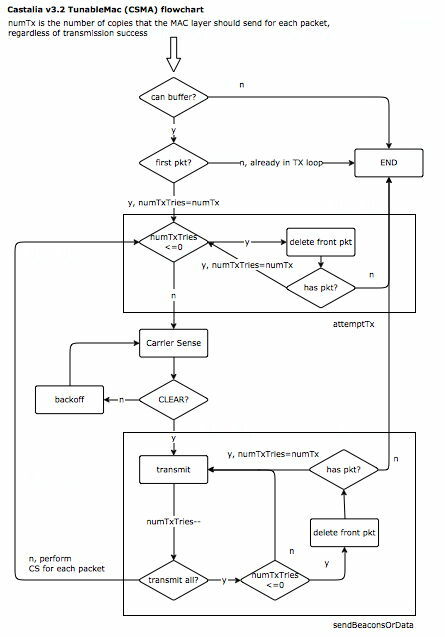 There may be different ways to describe it this but I hope that these flowcharts will help you understanding the Castalia implementation. Also, it is better if you can have a look at the source code at the same time: initially, the motivation of these flowcharts was to help understanding the source code. The classical CSMA model (and source code which is TunableMac.cc) is quite easy to understand. I've not included the various optimizations that are available such as p-persistance and backoff types. Adding the duty-cycling feature will simply put in SLEEP mode the radio when there is nothing to transmit so the impact on the MAC layer description is very small. This is why I also chose to not mention the duty-cycling feature in the flowchart. 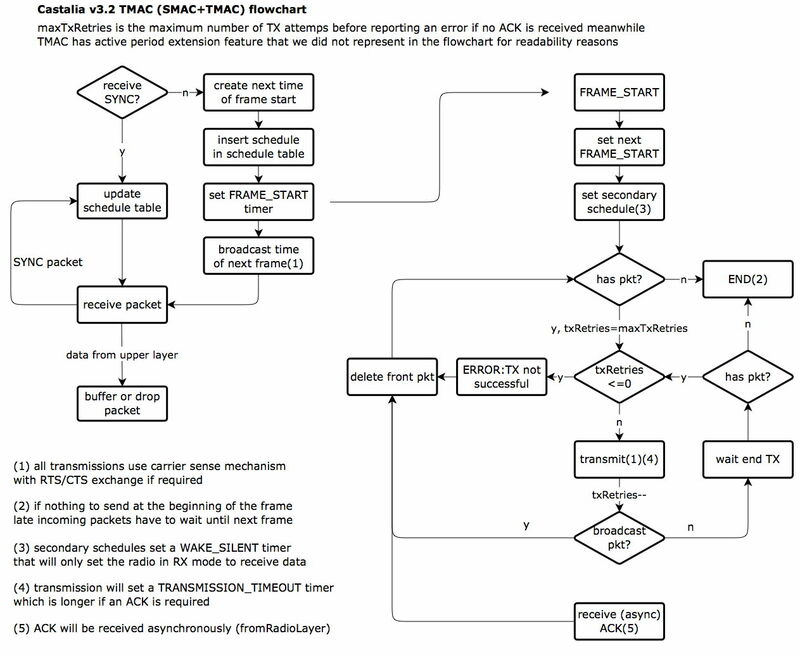 Note that Castalia user manual indicates that TunableMac module models an CSMA/CA behavior. However, as the RTS/CTS mechanism is not modeled, you should be aware that the current TunableMac module models a simple CSMA behavior, and not a fully CSMA/CA behavior. It is not that important as RTS/CTS are considered quite costly for WSN and CSMA will most likely be used, which justifies the Castalia model. The Mac802154 module source code is a bit tricky. My flowchart interpretation is certainly not the unique way, and it does not follow strictly the source code, which is quite impossible to do with a flowchart, and not the point anyway. However, I think that the main steps are here and will help you understanding what is implemented compared to the complex IEEE standard. Note that, as indicated in the Castalia user manual, the non-beacon mode is not implemented. I did not put the flowchart for the PAN creation by the coordinator, nor the synchronization phase of the non-coordinator nodes before being able to transmit data. The flowchart assumes that all these steps have been performed. These parts of the source code are quite easy to understand so you just have to take a look to the Mac802154.cc file. The TMAC module implements both TMAC and SMAC. Again, there are some steps that are not represented in the flowchart: active period extension, RTS/CTS exchanges and secondary schedule activation. However, these omitted features can easily be identified in the source code. Last information: these flowcharts have been created with the online flowchart tool www.diagram.ly. The .xml source files are available here: TunableMac-CSMA.xml, Mac802154.xml and TMAC-SMAC.xml.